Social conventions are the unspoken “rules” for living whose main purpose is to keep us in line. They are the (mostly) implicit norms that govern the myriad behaviors in which we engage each day, much of what we do without thinking. But conventions can be fluid and are subject to modification, and are in great part affected by history, culture, and various other environmental elements. Yet, despite our awareness of these rules which surround us, we don’t always like them. So, one might ask, what happens if we choose to ignore or even oppose a social convention? Is there a price to pay? These are some of the questions Lucas Hnath, recently dubbed “the most produced playwright,” unambiguously addresses in his acclaimed A Doll’s House, Part 2, the continuation of Henrik Ibsen’s daring 1879 play, A Doll’s House. The unhappy Nora neither enjoyed marriage nor motherhood. She was trapped, with few if any palatable options. So she up and left. Ibsen’s work was ahead of its time; it was feminist and controversial in its efforts to illustrate the oppression of women, as well as illuminate the repercussions of resisting the status quo. Nora may have walked out of her “doll house,” slamming the door behind her, but the rest of her story remained untold. One could assume that Hnath may have been left wanting by Ibsen’s uncertain conclusion. But unlike an audience who waits a mere few months to find out what happens following a television series’ cliffhanging season finale, Hnath wrote the continuation of Nora’s story well more than a century later. In it he tells us where he thinks Nora went and what she did. He tells us of her successes and failures. He also tells us what happened to the husband and three children she left behind. Hnath’s A Doll’s House, Part 2 hurdles us 15 years forward, but right back into the doll’s house where it all began. The play opens with a knock on that very same door out of which Nora had departed. Now, here’s an admission. I’ve never seen nor read Ibsen’s A Doll’s House and I did no preparation prior to A Doll’s House, Part 2 at Hartford’s TheaterWorks. And while the production was phenomenal, I can’t say I really liked Hnath’s characters. (As a writer, I once received feedback that at least some of the characters in a piece must be likeable, but that’s a point I can’t say I always agree.) In any case, A Doll’s House, Part 2 does not require that you have seen or read Ibsen’s original work; it is self-contained and a complete story. It is powerful, thought-provoking, even jarring; and from the exposition sprinkled throughout, you come to know much of what happened 15 years prior. All that aside, in readying myself for this review, I went back and read the SparkNotes for A Doll’s House as well as the synopsis on Wikipedia. 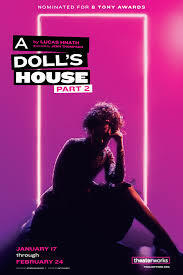 Then I pondered Nora’s predicament a while until I came to this realization: I felt completely different about the characters when I learned the full backstory; I also saw A Doll’s House, Part 2 in an entirely new light. Does any of that matter? Perhaps yes and perhaps no. It’s quite a conundrum, for in reality, when I was in the theatre watching A Doll’s House, Part 2, I had been thinking to myself – in some ways, everyone’s right and everyone’s wrong. And then again, no one’s right and no one’s wrong. It’s the twisted stuff of psychology – there just is no right or wrong when it comes to our individual experiences – and our personal experience of theatre is probably as subjective as life itself. Now, to the heart of the matter. In a nutshell, in A Doll’s House, Part 2, Nora has returned and she’s mainly none the worse for wear. She’d unashamedly abandoned her family and went on to do rather well for herself in most respects, but now she needs something from Torvald, the husband she left behind. The nanny, Anne Marie, who cared for Nora’s children in her absence, isn’t exactly happy to see Nora and tells her so. Unable to get what she wants, however, Nora must face her daughter, Emmy, in hopes that she will help the mother she never knew. TheaterWorks just cannot generate anything but a top-notch production and Producing Artistic Director Rob Ruggiero makes everything he touches turn to gold. The same goes for A Doll’s House, Part 2’s masterful director, Jenn Thompson. I have been so fortunate to see her diverse work and in my humble opinion, she guides every piece, whether it be a straight play or a musical, through a splendid dance, evoking brilliant layer upon layer of depth, warmth, and exemplary entertainment. Tasha Lawrence is a consummate actor, bringing outstanding complexity and authenticity to the self-absorbed Nora, the liberated yet still shackled 19th century female. Amelia White as Anne Marie is a fantastic foil to Nora’s strident ways. She pulls no punches as she calls out the brazen deserter for both her past and present actions. Sam Gregory is poignant as the discarded husband, Torvald. He plays the victim well (of note, it was something I saw less of retrospectively once I’d read the summary of A Doll’s House). Kira Player is excellent as Emmy, the abandoned daughter who doesn’t remember Nora, yet she smacks of a hereditary dose of moxie just like her mother’s. All of it comes together on a striking set designed by Alexander Dodge with its minimalist elements coupled with an electrified, contemporary outline. It is a marriage of past and present: Ibsen and Hnath; 19th century social conventions juxtaposed against today’s. It is complemented by impeccable costume design by Alejo Vietti, lighting design by Philp Rosenberg, sound design by Broken Chord, and wig design by Mark Adam Rampmeyer. The bottom line is this: theatre makes us think. We often see ourselves and/or identify with its characters. What gnawed at me the most about A Doll’s House, Part 2, and what probably created the most distress, was the central issue of a mother leaving her children. I’d never, ever do that. Did I say NEVER? EVER? As I remarked earlier, doing a bit of research did put things into a different perspective and perhaps it somewhat softened this issue for me. 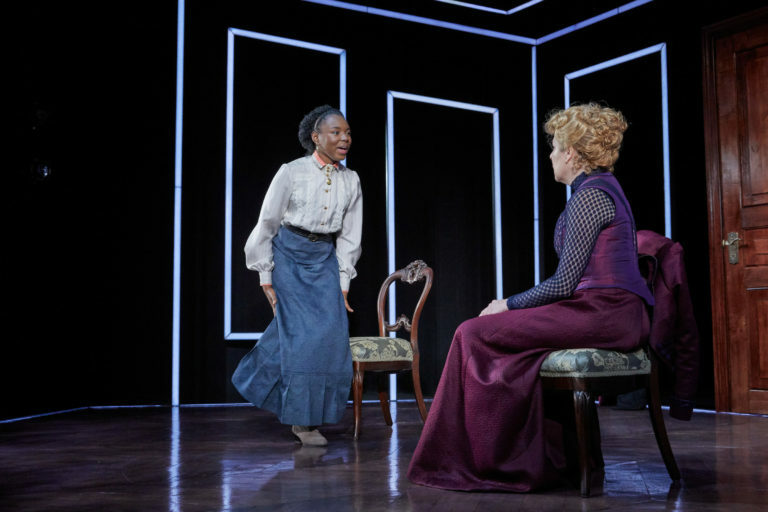 But whether or not you’ve seen Ibsen’s original, A Doll’s House, Part 2 is a dynamic piece of theatre and it will leave you thinking long after the final curtain. And like my husband said that night, I also wonder what Ibsen himself would think. It has finally happened. The last bastion for classical purists: the historical three-act play has fallen prey to the need of the collective consciousness (or unconsciousness) for ongoing closure. The play is no longer the thing; at least the notion that a world-famous, critically-acclaimed stage play written by arguably one of the greatest playwrights of all time has become the alpha and omega points of a narrative tale. 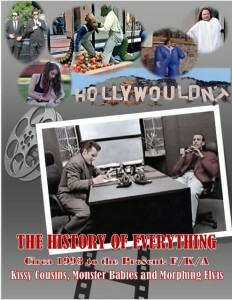 Prequels, sequels, spin-offs and franchises are staples of movies, TV, and books. 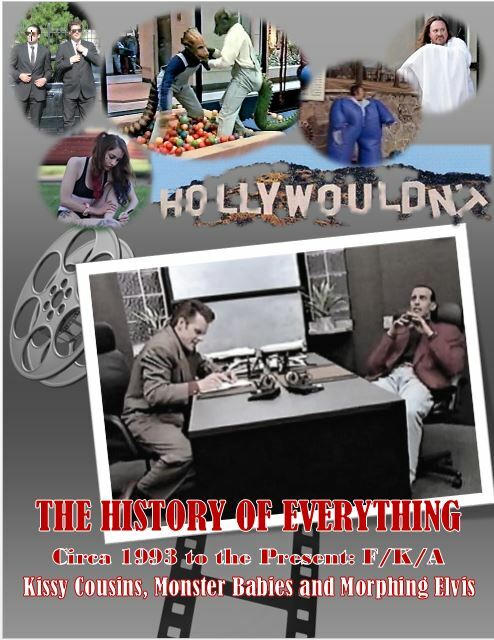 The trend was bound to permeate theatre. Not that a sequel to a play is sui generis. Andrew Lloyd Webber attempted it with his only moderately successful Love Never Dies, the sequel to The Phantom of the Opera. But that was an instance of the same creator dabbling with his own creation. No matter what, taking Ibsen’s three-act classic A Doll’s House, extrapolating events 15 years into the future, condensing it into just shy of 90 minutes, and presenting it as a sequel was a Herculean task at best. The playwright, Lucas Hnath, took an enormous risk by presuming to know what Ibsen himself may have had in mind for the future of the characters he created. He could very well, like the mythological Icarus, have challenged the gods by flying too close to the sun only to be consumed by the sheer audacity of usurping and modernizing a foundational pylon of classical theatre. I am thrilled to say that Lucas Hnath’s A Doll’s House, Part 2 directed by Jenn Thompson at TheaterWorks Hartford not only honors Ibsen’s work, but is both an homage and an incredible, thought-provoking play. One does not have to be familiar with Ibsen’s original masterpiece as exposition is so cleverly and subtly interwoven into the main dialogue and repartee; there is no confusion or ambiguity about the character of Nora, how and why she left her husband and children, or why, after fifteen years, she returned. Jenn Thompson’s direction is brilliant. Like a grandmaster chess player, she moves the characters through a complex journey and arc of emotions ranging from hate and deceit, betrayal to love, forgiveness and even understanding. We can see Thompson’s subtle maneuvering in the minimalist stage design which only exacerbates the emphasis and focus on the characters. Even the meticulous placement of the few chairs is designed to highlight both proximity and distance, confrontation and mediation. The acting by the entire four-person cast is pitch perfect. Tasha Lawrence (who Pillow Talking loved in The Roommate) gives an incredibly layered performance as Nora. She is able to portray with great verisimilitude the independence and strength that the character (a woman who left her family) needs to have. Yet, in her carefully crafted performance, we also can see the cracks of uncertainty, self-doubts and vulnerability which Nora also must have, especially after fifteen years of ups and downs. Amelia White is positively engaging as the often foul-mouthed nanny Anne Marie whose character arc neatly vacillates between her past loyalty and love for Nora and her present mix of disappointment, curiosity and passive-aggressiveness. Similarly, Sam Gregory gives a highly nuanced performance as Torvald, Nora’s husband who could never live down what he perceived as Nora’s ultimate betrayal – leaving the family to pursue her own selfish-goals and desires. Although it has been a while since I’ve read or seen Ibsen’s original, it appeared that Torvald had mellowed in the fifteen years since Nora left. So, while not forgiving her, there was at least, in Mr. Gregory’s performance, the glint of understanding as to why she did what she did. A Doll’s House, Part 2 not only stands on its own as a great piece of stimulating, engaging, thought-provoking theatre, but proves our never-ending search for closure can even be sated in the sequels to classics like A Doll’s House. Ibsen can rest easy knowing that his characters are in good hands. I look forward to the next sequel, whatever that may be. Maybe Waiting for Godot, Part 2?